Metamora, Indiana – The Whitewater Valley Railroad is proud to announce that newly rebuilt steam locomotive Lehigh Valley Coal Company #126 will make its debut on the historic ex-New York Central Railroad’s Whitewater Branch Line. The Whitewater Valley Railroad will be hosting Lehigh Valley Coal #126 starting the weekend of May 11th, 2012 for two weekends of education and fun. Historic Metamora, Indiana is only one of many planned stops at different rail operations in the US for this newly restored piece of history. #126 pulls a special Wild West-themed Twilight Limited Train to Dinner excursion departing from Historic Downtown Metamora, IN. Come and see Bandits, Marshals, Robber Barons, Fancy and some Not So Fancy Women as you roll through the scenic countryside. The Wild West entertainment is being provided by the Circle D Rangers. This steam powered excursion will depart at 6pm from Historic Downtown Metamora. Fares are $55 per person and include the round trip train ride, the meal, tax and tip. Train operates rain or shine. Seating is limited and reservations are required for this exciting evening trip. Tickets are on sale online at http://whitewatervalleyrr.us4.list-manage1.com/track/click?u=5a00779186a44742fb7a8f1ad&id=c2a5d65e11&e=37e53e1cfd or by calling the Whitewater Valley Railroad’s Grand Central Station at (765) 825-2054. To celebrate National Train Day on May 12th, 2012, Abraham Lincoln will be visiting Historic Metamora to ride Lehigh Valley Coal Company #126. Mr. Lincoln will be available for photo’s and questions before and during each train excursion. When the train arrives back in town, Mr. Lincoln will present one of his many speeches from the viewing stand near locomotive #126 and during each trip Mr. Lincoln will be speaking about the railroads and its effects on his election. 2:00 PM, and 4:00 PM. Along the way, remnants of the Whitewater Canal locks, the restored Laurel Feeder Dam, and portions of the West Fork of the Whitewater River can be clearly seen. Fares for the scenic ten mile round trip excursion pulled by Lehigh Valley Coal #126 are $15 per person ages 2 and up. #126 rolls along the scenic Whitewater Valley. Steam Trains will begin operations at 10:00 AM with four departures of Lehigh Valley Coal Co. #126 at 10:00 AM, 12:00 PM, 2:00 PM, and 4:00 PM. Along the way, remnants of the Whitewater Canal locks, the restored Laurel Feeder Dam, and portions of the West Fork of the Whitewater River can be clearly seen. Fares for the scenic ten mile round trip excursion pulled by Lehigh Valley Coal Co. #126 are $15 per person ages 2 and up. 10:00 AM, 12:00 PM, 2:00 PM, and 4:00 PM. Along the way, remnants of the Whitewater Canal locks, the restored Laurel Feeder Dam, and portions of the West Fork of the Whitewater River can be clearly seen. Fares for the scenic ten mile round trip excursion pulled by Lehigh Valley Coal Co. #126 are $15 per person ages 2 and up. NOTE: Lehigh Valley Coal Company #126 will operate from Historic Metamora Indiana. In addition to #126, the regularly scheduled Valley Flyer excursions from Connersville to Metamora will be operating as normal. All trains operate rain or shine. Metamora is Indiana’s treasured 1838 canal town. Nestled in southeastern Indiana’s beautiful countryside, Metamora is steeped in history and famous for its preservation of Indiana’s oldest and still operating water-powered grist mill. Located 60 miles east of Indianapolis and 35 miles west of Cincinnati, A must see town that retains all of its traditional charm and languid atmosphere. Shop in stores housed in buildings dated back to the early 1800s, eat and above all else… Enjoy the slow relaxing pace of the past! For more information on Historic Metamora, visit Metamora online at www.metamoraindiana.com. Lehigh Valley Coal Company #126 is a 40 ton saddle tank steam locomotive built by the Vulcan Iron Works of Wilkes Barre, PA in May 1931. 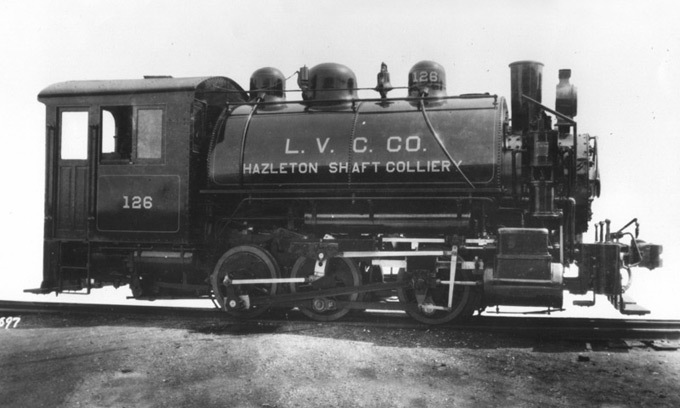 #126 went into service at the Lehigh Valley Coal Company in 1931 at Hazlenton, PA. Later it was sold in 1954 to the Heidelberg Coal Company at Avoca, PA. The engine was then sold to John Bauman, a scrap dealer, in Carbondale PA and stored in the Delaware & Hudson Railroad roundhouse at Carbondale until it was purchased by the Gramling Locomotive Works in the fall of 1993. For more information on #126 or Flagg Coal Company #75 visit the locomotives online at www.haveenginewilltravel.com. Travel through time on Indiana’s most scenic railroad. Established in 1972, the Whitewater Valley Railroad is a non profit railroad history organization. It is an operating railroad museum dedicated to the preservation of a historic branch line railroad, the restoration of railroad equipment, and to the conduct of railroad educational programs. The railroad is operated by trained volunteers and all proceeds from this event will be used to further the organization’s mission. Come to Historic Downtown Metamora for this spectacular railroading event, and return to a time when the railroad moved the nation and the short line railroad was a small town’s best friend. Call (765) 825-2054 for more information and reservations. Visit the Whitewater Valley Railroad’s online at www.whitewatervalleyrr.org and you can follow us on Facebook. Previous Topic: All Aboard for the Tampa Union Station Centennial and National Train Day!